“I only trail ride.” Every time I hear someone say this, I am impressed. To be prepared for every eventuality that can come up while out on trail, a rider has to have a level of horsemanship that is to be envied. Of course that level of ability is rare. Most of us are looking to improve. Some trail riders have a tendency to dislike arena work and showing. (“It’s soooo boring!”) Most say they don’t like competition. I can understand that. But in an effort to become a better leader for a trail horse, there are some good reasons to ride a dressage test or two. Last week our barn had a small show for boarders to prepare for show season. It dawned foggy, windy and wet. Horses were crisp; riders excited, and the ride times getting closer. Several folks were riding, each nervous about one thing or another. Stress was thick, and the path ahead was not smooth. Facing the prospect of riding for a judge isn’t a lot different from crossing quick-moving water or coming upon a herd of deer. It is an opportunity to grow partnership with your horse. I am suggesting that trail riding and showing have more in common than not. Showing is choosing stressful situation and giving you and your horse a chance to benefit from it, within safe parameters. Perhaps there are as many obstacles in an arena as on a trail. 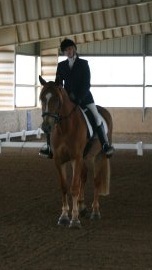 If you don’t believe me, you might want to try experiencing the invisible obstacle course disguised as a dressage test. Giving your power away to a judge or a roaring dirt bike isn’t going to help your horse. Trail riding and showing both have the same goal. It isn’t about being better than other riders; it’s about forging a partnership with your horse that is strong and consistent enough to turn hard challenges into confidence-building experiences, regardless of your surroundings. It’s been a while, but ‘different kind of trail ride’ I particularly enjoy is chasing cows on my dressage horse. Yahoo! ← It's Not About the Hat. I had never thought of this parallel between “trail riding” and dressage, but it is right on target! Dressage horses need to focus on the rider, so it’s possible the trail horse has more external focus – but that makes the horse-rider relationship even more important on the trail. When you need control, it has to be there.